Micro-Needling is a skin needling system that allows for controlled induction of the skin’s self-repair mechanism by creating micro “injuries” in the skin which triggers new collagen synthesis. It’s aimed to stimulate the body’s own collagen and elastin production to improve the appearance of acne scaring/pitting, fine lines and wrinkles. Automated micro-needling also creates superficial micro-channels which can be used with topical gels, serums and even PRP (Platelet-Rich Plasma) to give the patient a step up to their micro-needling treatment. Good candidates for this treatment include patients that want to see improvement in acne scaring/pitting. Also for fine lines, facial scars and improvement of the skin’s overall appearance. Immediately after the treatment you will notice redness to the skin. The total healing time depends on the micro-needling setting used and the number of overlapping passes. On average, patients are red up to 2 to 4 days. Many patients heal completely in as little as 24 hours. 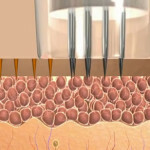 The feeling associated with micro-needling is similar to light sandpaper being moved across the skin. While some areas are more sensitive than others, the speed of the reciprocating tip reduces discomfort while the applied hydrating gel also makes the treatment more tolerable. The patient will also apply a topical numbing cream on the face (30mins or 1hour) before the treatment. What should I avoid before doing a micro-needling treatment? Discontinue using Auto-Immune therapies, Retin-A 24 hours before treatment. Patient with facial outbreaks such as herpes must take medication 48 hours after micro-needling treatment. Also avoiding the sun pre and post treatment is very important. 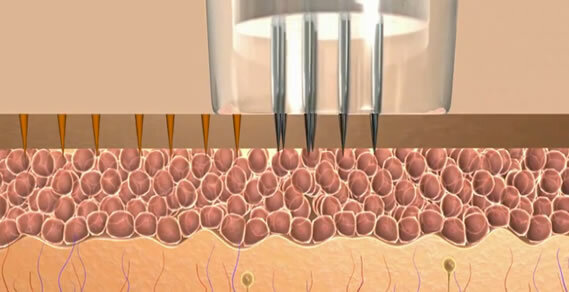 Depends on the skin condition the patient has and what they want to achieve with their micro-needling treatments. Some patients will require a single treatment, for a more smooth, refresh skin. However, patients with deep wrinkles or acne scars are recommended to receive a series of 3-4 treatments spaced about 6-8 weeks apart.